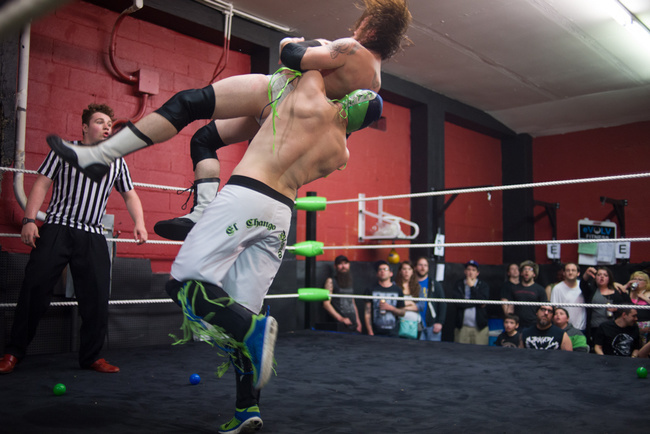 It was a packed Saturday night inside Seattle’s eVOLV fitness center and the crowd was growing restless for the final match between “El Chango Blanco” and Eddie Van Glam, representatives of the 3-2-1 Battle and BXCW factions. It was the long-awaited Battlemania show of “3-2-1 Battle”, one of the biggest professional wrestling outfits of the Northwest. All the belts were on the line that evening, as well as the loser being forced to close operations of their respective organization, so for professional wrestling standards, this bout was not only for the glory, it was for survival. 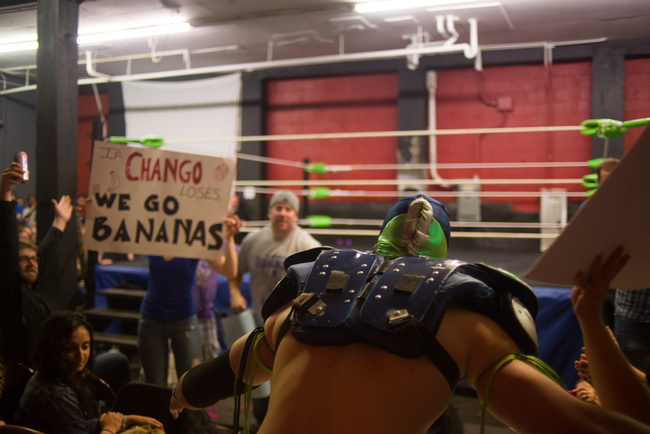 The crowd was overwhelmingly pro-Chango. 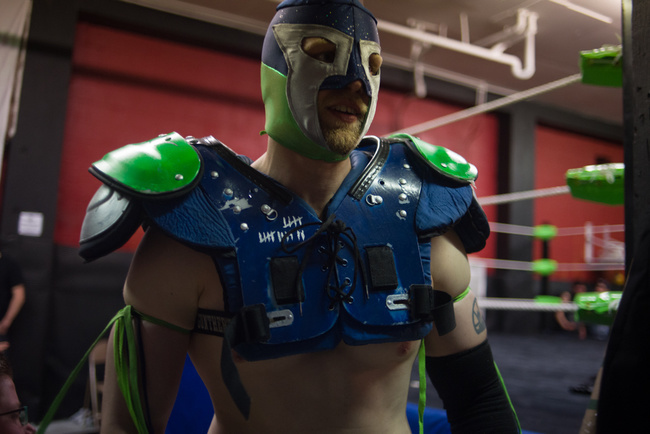 Chants of the hero’s name rang throughout the venue as he walked towards the ring with everything from his tape and his tassels, to his signature luchador mask decked out in Seattle Seahawks blue and green. Van Glam walked in second, dressed as a sort of savage renaissance warrior donning a mid-sized fur cape and headdress. Aside from the small section of BXCW fans, the caped champion came out to a rain of boos, as BXCW is the “bad guy” faction of the organization, analogous to the nWo of the WCW. Van Glam, once a former ally to his adversary, switched sides in a surprise move months earlier, and had been putting “El Chango Blanco” through a number of humiliating group beatings ever since. Battlemania was the opportunity for payback. Underneath the mask was Russell Tupper-Brown, the groomed savior of the organization and that night was the crescendo of a two-year storyline. Inside the ring, “El Chango Blanco” represented the goodness of upstanding moral fortitude. Outside of it, I pretty much found him to be the same way. One of the first thoughts I had upon meeting Tupper was, “I like what this guy is about,” which is basically someone from around the block that cares about the community, and dedicates most of his life to serving it. I first met Tupper while he was working security at a local bar during my patrol with the MMA fighting superhero Phoenix Jones, and the two knew each other from training together and having similar views on what it meant to protect the city. As he often does, Tupper joined the masked superhero on patrol that night wearing a crimson lucha libre mask taken from his pro-wrestling persona, though like Jones, he too had a fairly extensive background in MMA. 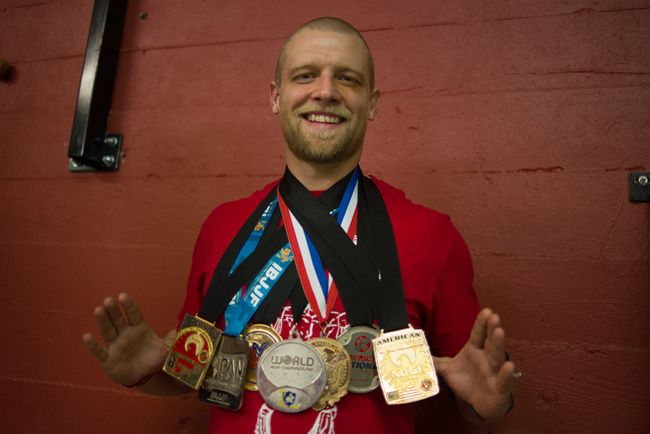 In total, Tupper spent eight years training with Team Punishment, during which he earned a number of American, Pan-American and world jiu jitsu championships, and landed a top spot as head jiu jitsu coach at the Rampage Fitness Academy. He also earned a first degree black belt in BJJ and Vale Tudo from Wladomiro Perez Jr., who is probably best known for his two appearances on Seasons 7 and 10 of The Ultimate Fighter, and his affiliation with Cia Paulista, a renowned fight team out of São Paulo that later went on to train some of the UFC’s biggest stars, and also the brand that Tupper would bring back with him when he returned to the Northwest. While things in his fighting career were progressing steadily in California, his personal life was at a standstill. Custody complications with the estranged mother of his only child kept him bound to the Golden State, despite wanting to make a move back home years earlier. The doors opened up when the mother moved out of state, granting full legal custody to the Seattle native. 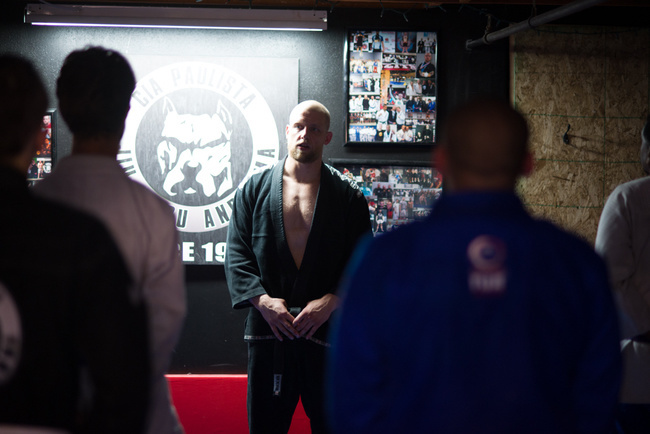 Since returning, Tupper continued earning accolades in the fighting world, landing his current position as head jiu jitsu coach at the American Martial Arts Center (AMC) and training a variety of elite-level athletes, ranging from the defensive line of the Seattle Seahawks to current UFC Flyweight Champion Demetrious Johnson. He’s also the first person to earn a coaching position at the famed academy without having been one of its original students, which speaks volumes to his athletic abilities and coaching instincts. 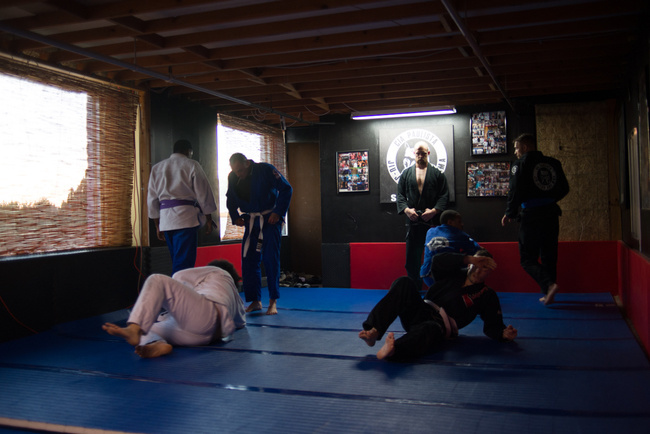 And he remains true to his word about bringing the fighting arts back home too, running a private club out of a small room in the city’s Capitol Hill district that officially serves as the Seattle branch for Cia Paulista. The front entrance to the dojo is located inside of a small parking garage on one of the neighborhood’s main avenues, and walking through the door is like walking into vintage party supply storage room. Classic couches, old-school arcade machines, and a strange armadillo butler statue stare at you while climbing the stairs into the training space. I’ve never personally stepped foot into the infamous “garage dojos” that jiu jitsu professors from Brazil used to tell me about, but this is probably an American version of it. Blue mats and a couple of cushions line the 528-square-foot space, equipment costs that came out of Tupper’s own pocket to launch the venture. The walls are adorned with photographs of the instructor with guys like Rampage Jackson, Eddie Bravo, and Tito Ortiz, proving just about every affiliation he mentioned to me earlier. The property is owned by a childhood friend that gifted the space for Tupper to conduct classes, which drastically cut down the overhead costs of the dojo. Making money, however, isn’t the motivator. “A lot of my students at Cia Paulista are personal friends of mine from before I moved away, people I grew up with, or friends of friends. A lot of us came from not very privileged background, real inner-city urban kids who had gotten into a lot of physical altercation and had to deal with a lot things like gang violence and things like that,” Tupper told me in describing his student demographic. “I was lucky enough to learn from some of the best martial artists in the world, and then I was lucky enough to get the ability to create a home to teach that in the community. I really wanted to give people access. I really wanted to give people that were going to be put in dangerous situations, the chance to have the tools to work their way out of those things and also to give them another lifestyle. As word got out of his return and his newly acquired accomplishments in the martial arts world, the “3-2-1 Battle” wrestling organization reached out to Tupper to fill in one of their principal roles. During his teen years, Tupper founded and participated in a number of matches for a backyard-wrestling league, and earned a championship going by the name “Purple Elegance King Cadillac Seville”, making him an already familiar name in the local pro-wrestling scene. He’s since accepted the position with “3-2-1 Battle”, and for the past two years has managed to balance being a professional wrestler and an active MMA fighter, being one of very few athletes to participate in the two sports simultaneously. In light of the recent articles discussing finishing moves and fixed fights, it is worth looking at how the worlds of professional wrestling and MMA both differ and imitate one another. The first and perhaps clearest distinction is that professional wrestling scripts its matches, which snowballs into the perception that it is therefore “fake”. While the use of predetermined outcomes gives credence to that argument, I’d also argue that the actual movement and punishment to the human body does not. In attending one of their practice sessions, I saw plenty of complex strikes and body slams that caused some very real bleeding and bruising. According to Tupper, the two sports have more in common than most think. Tupper compared the act to two jazz musicians or freestyle rappers telling an impromptu story where the plot evolves based on audience response. If a certain character receives an unexpected reaction, wrestlers in the ring pull an audible that potentially alters the performance from its previous plan. Seldom does that decision cause a change to the final outcome of the match, but according to Tupper, it’s happened before. Like writers in any genre, storyline writers for pro-wrestling can’t always predict what the audience wants to see, which at the end of the day, is what sells tickets. And in some ways, similar elements can be seen in legitimate fighting competitions too, as the challenge most fight promoters face is finding that balance between a legitimate sporting contest and packaging it into a sellable product to its viewers, because at the end of the day, it needs to be entertaining. Theatrical application and marketing concerns do have their consequences to a fighter, however, especially when he crosses back over into a legitimate martial arts competition. As much as one might mimic the other, they are still very different in the end. But for Tupper, the crossovers between the two worlds extend even beyond the promotional packaging and moves inside the ring. The kneepads and elbow sleeves he uses during his pro-wrestling matches were first purchased when he started competing in MMA. Though the name “El Chango Blanco” is Spanish, the moniker was originally gifted to him by a squad of Brazilian black belts to describe his aggressive and unorthodox style during an IBJJF competition. Even the shorts embossed with the words “El Chango Blanco”, was a gift from his jiu jitsu sponsors. All of this was explained to me back at Battlemania as I sat in the back dressing room with him waiting for the final match to begin. The stage manager came by to give the final entrance cue, and before setting out, Tupper leaned in and unknowingly spoiled the ending for me. The final match went on for a good twenty minutes, filled with plenty of jumps, slams and unexpected character intervention from both camps. “El Chango Blanco” managed to get the 3-count pin and won both belts to a hail of cheers and crowd relief. His son Roman Tupper-Brown, now 10, dashed into the ring and was immediately hoisted onto the shoulders of his father, the new 3-2-1 Battle and BXCW Champion. And even though the whole thing was staged, you couldn’t help but feel good for the guy. No matter what lens you look through, “El Chango Blanco” represents principles that we can all stand behind. Within the storyline, it’s a steadfast attitude towards victory that overcame a past betrayal and overwhelming odds. Outside of it, it’s about a guy who followed his heart, found some treasures, and worked through adversity to bring those treasures back to a city he loves. And that night, both characters got to celebrate championing those obstacles with the son on their shoulders. At least for me, that’s a damn good story to root for.